"I constantly have hope that they'll do the right thing and keep these people in prison, and now my hopes have to go with the governor"
Robert Kenneth Beausoleil talks with newsmen after the jury returned a verdict against him of first-degree murder in the torture slaying of musician Gary Hinman. 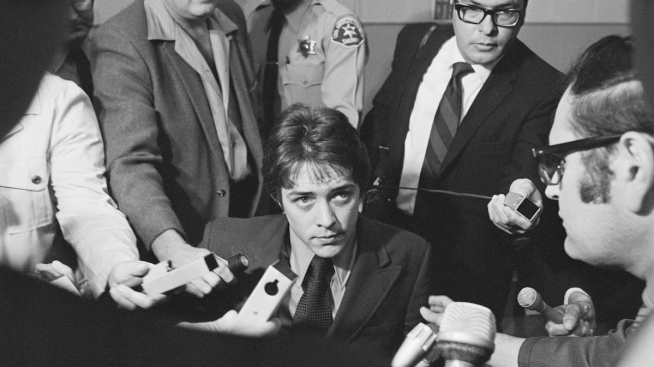 Beausoleil, 71, was not involved in the most notorious killings of actress Sharon Tate and six others by the Manson "family" in 1969. He was convicted in the slaying of musician Gary Hinman that same year. California's incoming governor, Gavin Newsom, could block the parole in coming months. Termed-out Gov. Jerry Brown has consistently stopped releases for followers of the cult leader, who died in prison in 2017. The Los Angeles County District Attorney's Office, which has opposed such paroles, did not respond to a request for comment. Gary Hinman's cousin, Kay Hinman Martley, who attended Thursday's hearing, said Beausoleil was already lucky once when his death sentence in 1970 was reduced to life in prison by an appeals court in 1973. "I constantly have hope that they'll do the right thing and keep these people in prison, and now my hopes have to go with the governor," she said, adding she plans to reach out to Newsom to tell him "this man does not belong outside the walls of prison." Beausoleil's attorney, Jason Campbell, said his client is no longer dangerous and that his release "is long overdue." "He is a very thoughtful, insightful and compassionate person. He's not the person he was in 1969," Campbell said. "He's matured dramatically since then." Sharon Tate's sister, Debra Tate, who also attended the hearing, said she will mount a social media petition drive so parole opponents can "make their feelings known to Gov.-elect Newsom, because he has a tendency to be very liberal. Without public opinion weighing in on this, there is no hope."